Thermoformed dunnage trays are designed to protect and transport products and components during assembly, manufacture, and distribution. These functional thermoformed trays provide handling solutions for automated and manual platforms and operations; safely move products from location to location within a facility and to supply-chain partners; and, provide dense pack-outs for shipping efficiencies. Thermoformed plastic dunnage trays are highly-engineered and high-performing, providing packaging, assembly, work-in-process, and shipping solutions. Stack and rotate design features means that the product is not supporting the load when stacked; instead, the weight of the filled trays is supported by design features on the dunnage tray perimeter. This provides product protection and dense pack-outs for shipping. Thermoformed dunnage trays can be designed for automated handling: colored dunnage trays can interface with robotic eyes; formed locators on the tray can orient the robot for pick-and-place operations; and, tight form and die-cut tolerances can be maintained for successful integration into highly-engineered automated platforms. Medical dunnage trays produced in an ISO Class 8 Cleanroom provide assembly, manufacture, and shipping solutions for sterile and non-sterile medical devices and components. 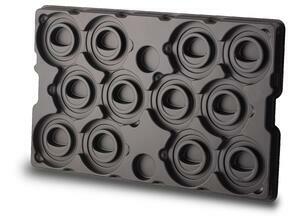 Thermoformed dunnage trays can be designed for reusability. Plastic dunnage trays can be designed up to 30" x 38" x 6"; formed from .010" - .080" thick plastic; and, provide textured, matte, or glossy finish. Thermoformed dunnage trays can be made from ESD material for highly-sensitive electronics and components. Dordan Manufacturing is a family-owned and operated company that has been designing and thermoforming plastic dunnage trays for 60-years. We are a full-service engineering-based dunnage tray designer and thermoformer, offering all dunnage tray design, tooling, and thermoforming in-house. This integration between dunnage tray design and manufacture allows for the production of high-quality thermoformed dunnage trays in quick turnaround at competitive pricing.